The map below shows the witnesses location with the first estimated trajectory. 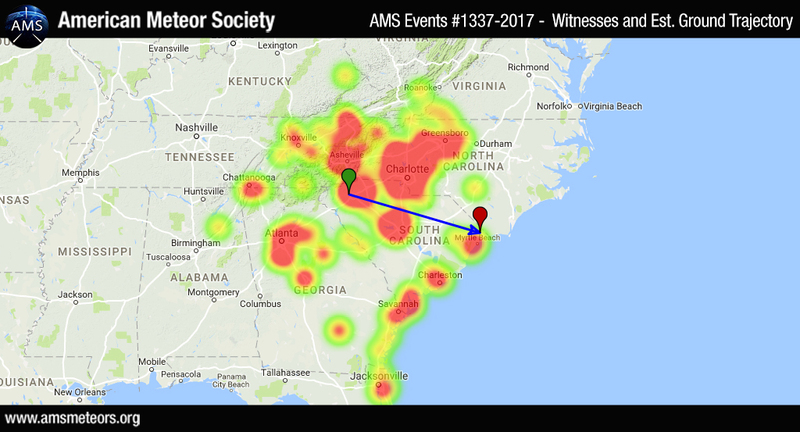 The preliminary estimated trajectory plotted from the witness reports shows the meteor was traveling from the Northeast to Southwest and ended its visible flight near Longs, SC (Horry County). I was sitting on the beach in Kure Beach and saw it with five other folks. Looking towards Fort Fisher. (April 12, 2017. about 8:40 pm) It was also seen in Asheville, so it crossed the whole state. Visible for at least 5 seconds, moving low & very fast & arced across the entire sky. Actually made a whir sound, or, several of us believe we heard it as well as saw it. IT was a very large fireball type, white, and broke into two or three pieces before disappearing over the ocean. I expected an explosion, but, it just disappeared over the water. I believe it was travelling from West, to East or Southeast. Beautiful. If visibility was ten miles, and it lasted five seconds, can we figure out the velocity? Not without more information. The object traveled a lot farther than 10 miles when it was in your view. If we assume that the path was straight, then we could use a triangle method, which we would need the precise angle of when you first saw it to when you last saw it, then the angle the object made with the horizontal, which would be nearly impossible to get now. If we assume that it was not straight, then we could use arc length, but we would need the radius of the curve made from the descent of the object. I was in York when I saw it, and I watched it for a few seconds as it passed trailing smoke until it went out, but a fellow coworker said that it lit back up about a second or two later. We witnessed the meteor in Thomson, GA last night. Out in the country with only a soft streetlight, we were awestruck by the fireball as it shot across the sky. The siting seemed to last forever. Saw this from the cockpit last night. Visible from our 11 oclock to 5. Oh very cool! I wondered when I saw it what it would have looked like from a plane. My dad saw this from the west side of Augusta, Ga last night about the same time everyone else saw it. He said it looked like a rocket. Kind of reddish orange with a tail. He said there was no sound and it kind of went down over the horizon. He said it seemed kind of low in the sky. Like it was barely over the trees, although he knows it was higher. My Wife and I saw the same thing in Macon Ga. To me it looked White with the reddish orange tail sparkle like quite long. No sound, low in the horizon, seemed to be a good 8 to 10 seconds visible until it went out of sight. Planes go over my house in Fort Mill, SC. I was watching two heading toward Charlotte and suddenly a streak was heading right for them heading toward the East. At first I hoped it wasn’t a plane crashing because it was bright, traveling fast and in a downward line. Was at 1000 ft AGL with night vision, south of JAX flying North preparing to enter the river transition. Pretty cool. We saw it on Hilton head, SC. Coolest thing ever! We saw it so clear. It was low and seemed to last long, like a diamond shape with a long glowing tail. It was stunning, never seen anything like it. We are in Greenwood Sc. I just happened to be visiting my family in Campobello, SC when I viewed this fireball passing through my entire view of the sky (while lying in my hammock). It lasted long enough for me to snap a few seconds of video, but nothing like the nest cam on twitter. Trajectory path seems correct to me. We were in our driveway in Easley SC – saw it come straight across our back yard while checking on our horses. My roommate and I saw it Wednesday night as well. It was low and slow. 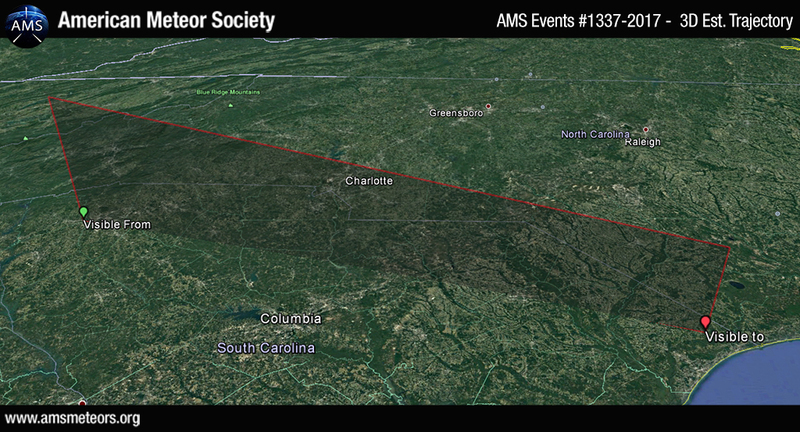 I thought it was going to hit Anderson South Carolina and was waiting for the Shockwave. I could even swear I heard the fizzling of the burning Mass. It seemed like it went on and on for quite a while before it left my sight and dropped into the tree line. I live in Seneca South Carolina and it was headed from the Northwest to the southeast. I was traveling east on I26, just by the Woodruff, SC exit. Happened at 840 pm. I was amazed at the size and also that it covered the entire sky from West to the east. Yellowish in color and appeared kind of square in formation. Sure wish I had that dash cam I’ve been wanting. Amazing sight! My husband and I were sitting on our front porch on April 12 watching for the space station. Our porch faces west. A very bright fire ball with a red tail came shooting across the sky. It was rather low. It was one of the most beautiful sites I have ever seen. God’s power is awesome! We saw the beautiful sight from the top of Stone Mountain in Stone Mountain Park, GA. We had hiked up with our grandchildren and a few other family members for an evening hike to the top of the mountain. The fireball appeared to be low in the sky (lower than I remember ever seeing something like this) and lasted longer. It was bright white with a tail and disappeared beyond the horizon. Absolutely beautiful! The kids were amazed and won’t soon forget what they saw. Our entire 4H camping group located at Tybee Island, GA saw this site. It was approximately the same time as already stated. If I was facing east, it was to the left of me. Streaked across the sky, slow, moving from West to East. The tail stayed visible for a very long time headed to the Ocean and lost sight of it a little past the tree line. Beautiful. My wife and I both just happened to look up and see it traveling West to East in Carrboro, NC about 30 degrees above the horizon. It had a short tail, and was extremely bright. It lasted close to 10 seconds. Saw this as a solid object/glowing center with reddish outline headed eastward from Greeneville, TN. The light dimmed briefly and it had a spark from the side, then fully lit up again. Very bright white. No tail. Moved slow, 20-30 seconds ALL THE WAY ACROSS THE SKY, horizon to horizon. Faster than a plane or jet and brighter than Venus. Saw a green streak across sky in nw path as my husband and I were driving West on rt26 towards Columbia at 10:00 pm, near Otangeburg. I am almost positive I found where this fireball/meteorite hit.